This will be a two-part posting about Dot, the dipper. It is not unusual for a dipper to be featured on this blog. 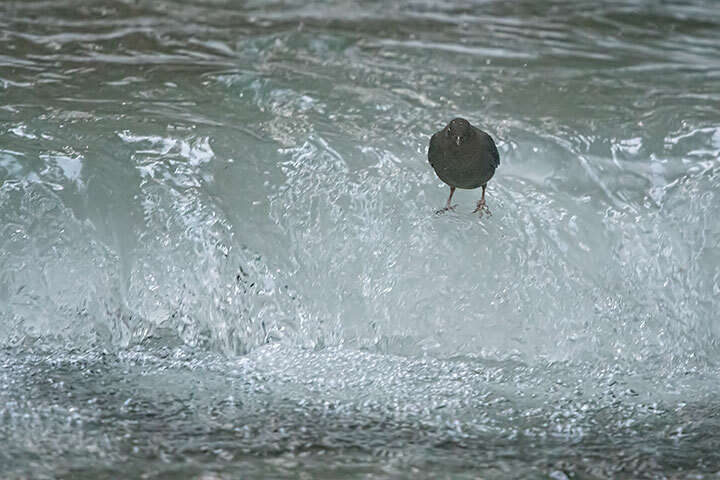 Although, not a common bird, I happen to live near dipper central and manage to watch this strange aquatic songbird now and then. Two days ago, as the temperature dropped, I was curious about how dippers might be handling their creek’s border ice and anchor ice. After all, dippers feed primarily on the stream bed, and either form of ice can block a dipper’s access to their delectables. I wrote about dippers and ice in one of my longer essays. 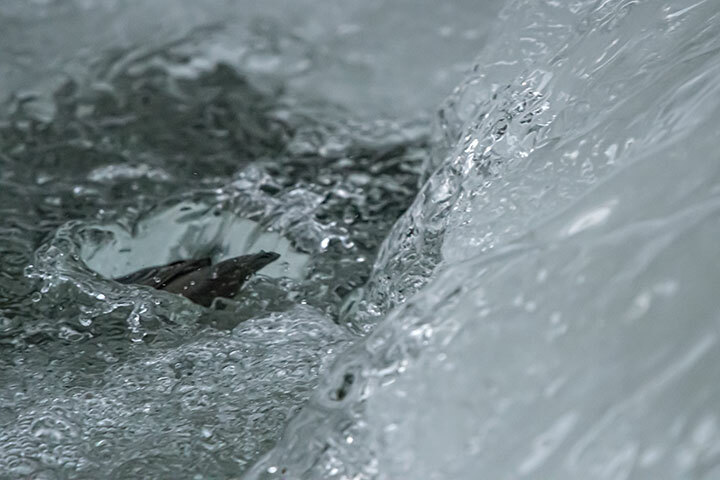 In it I explored how dippers deal with a creek’s ice, and even speculated that it was ice formation that influenced their preference for turbulent waters. This time I was able to watch something new, indeed, two somethings new. The first, considered here, is a minor wrinkle. The second, treated in the next posting, is a more interesting behaviour. Both postings treat the same bird, one with a white spot on its back, and so dubbed, Dot. The problem faced by dippers when the temperature drops is that a creek freezes. Border ice forms in the calmer waters along the stream edges and so squeezes access from the surface. Indeed, in tranquil streams, border ice spreads across the stream and blocks all access to the stream bed. While this is minimal on fast flowing streams, it is there that anchor ice forms on the stream bed. 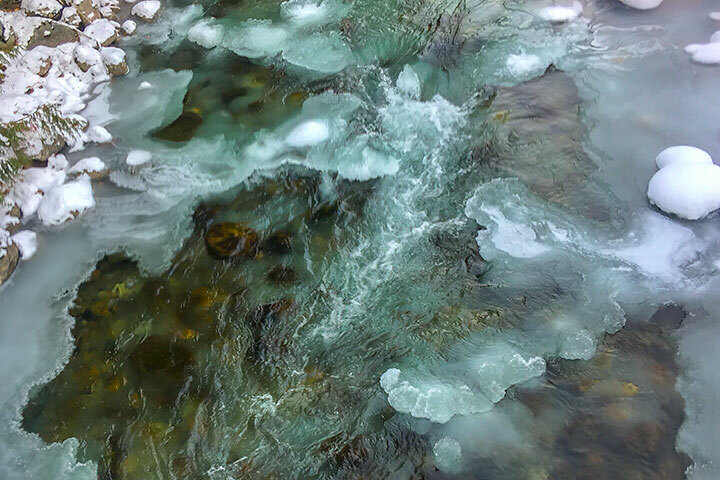 Sometimes a creek has a goldilocks zone where the flow is not gentle enough for border ice to cover it all, but not turbulent enough for anchor ice to spread over the bed. On this occasion, I did see one dipper hunting in such a zone. However, Dot opted to hunt amidst the chaos, finding access to the stream bed in the smallish gaps between both forms of ice. This is general area in which Dot was hunting. The border ice is atop the water, while the anchor ice is the patchy greenish ice on the stream bed. The dipper must find gaps between both. Dot would watch while standing in the water atop the anchor ice covering a weir. From this perch, Dot would dive into the waters below to search between patches of anchor ice. After one of its dives, Dot surfaced with a quickly downed fertilized egg of a Kokanee. The white spot that gives this bird its name is visible on its right side. This entry was posted in birds, fish. Bookmark the permalink. Next to the Kokanee Salmon, dippers will always represent the heart of Kokanee Creek to me. I can always count on seeing and hearing a dipper on winter days at Kokanee when so much is quiet and still. Thanks for the great post Alistair. Thanks…I enjoyed a couple days ago on the Kaslo River just these antics…such an entertaining, busy bird! Like Karen, I’ve been enjoying the dippers on Kaslo River, just downstream of the highway bridge. I watched as one dipper plunged into quite a turbulent area of water between boulders, and was tossed and rolled some distance downstream, underwater, but of course emerged unscathed! When the air temperature is so low it amazes me how that tiny bird can stay so perfectly insulated while constantly diving. I learned about a new bird for me! I love it! Thanks for the information and wonderful photos again! 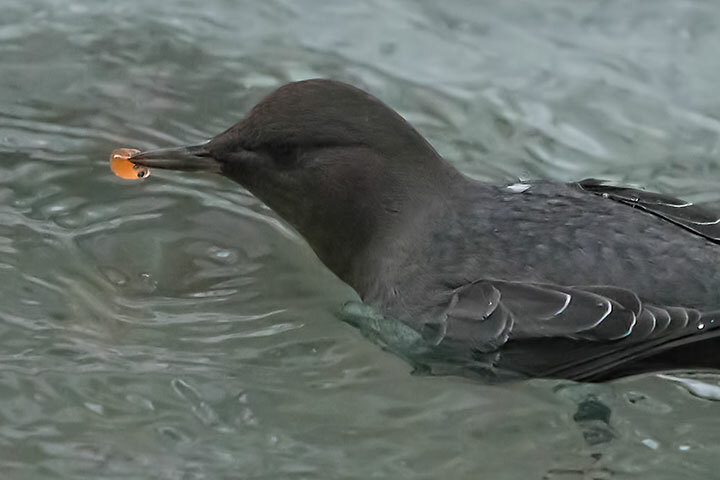 I believe you are most likely the most knowledgeable person in the Kootenays on dippers, and hell of a photographer to match!